Welcome to the York River Inn! The York River Inn Bed & Breakfast is situated on a high bluff overlooking the York River in a colonial-style building. It is the only waterfront bed and breakfast in the Yorktown and Colonial Williamsburg area. The York River Inn Bed & Breakfast is the ideal location for a relaxing visit in historic Yorktown, Virginia. 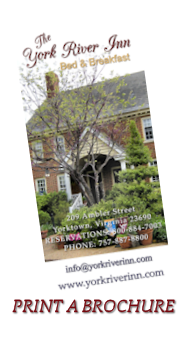 The York River Inn B & B is also a delightful place to enjoy the historic areas of Yorktown and Williamsburg. Gracious settings, generous amenities, and knowledgeable host create a memorable experience rather than just a night away from home. All three guestrooms are filled with standard amenities enhanced by many charming and useful additions--the innkeeper's extensive travel and hospitality career have contributed to his skill at providing the finest accommodations possible. The common area includes a sofa and comfortable chairs, where you can browse through piles of current magazines. The refrigerator is fully stocked for guests. The innkeeper has a vast selection of Virginia books, maps and extensive materials on travel from all over the US and the world. You are welcome to enjoy the shared deck with deck chairs, as well as the cookies and treats always set out on the dining room table. A gourmet breakfast served in the elegant antiques-filled dining area overlooking the river is a highlight of the experience provided at the York River Inn. The Inn is only a short distance from the colonial area and other attractions of Yorktown and is only 15 minutes from Colonial Williamsburg by the way of the scenic Colonial Parkway. The local area is filled with historic, cultural, and entertainment activities without the stress of a busy crowded town. In Yorktown itself are two major historical attractions celebrating the winning of American independence October 19,1781 when George Washington accepted the surrender of the British under Lord Cornwallis, an event commemorated by the 1881 victory monument just down river from the York River Inn. 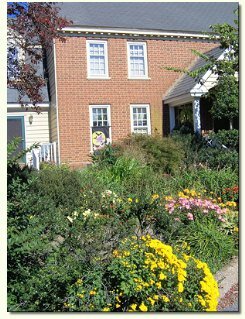 ...A stay at the York River Inn B&B is not just a stay, but a total experience. The atmosphere, furnishings and hospitality are unique, however, the breakfast is a pure work of art..."
© Copyright 2008-2015 ~ York River Inn ~ All rights reserved.